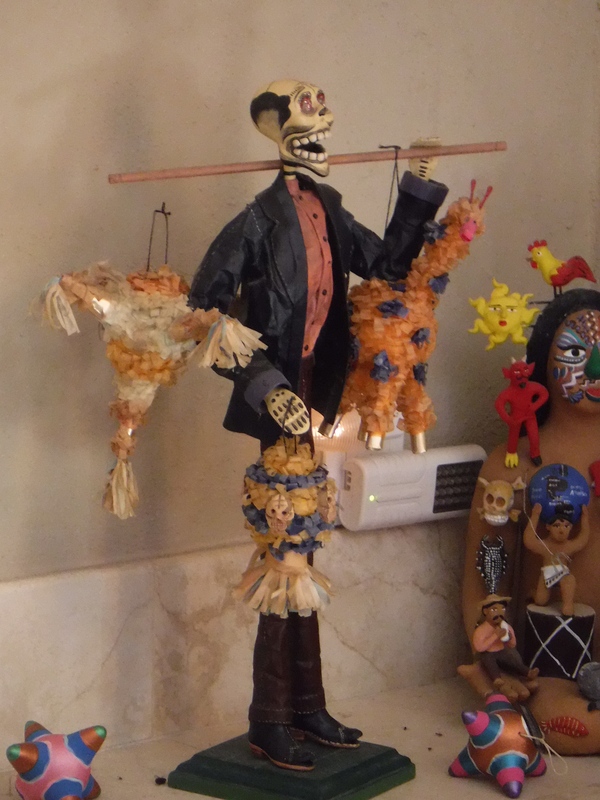 A skeleton man carrying his pinatas to market. 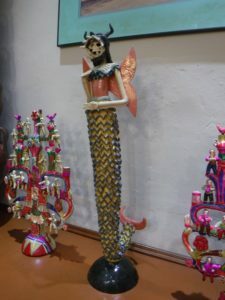 La Casa de los Venados is a private home with an amazing collection of contemporary Mexican folk art. It is located in downtown Valladolid and is open to the public for free tours every morning at 10:00. It’s difficult to convey the beauty of this creation. On every table space ar displayed very tastefully pieces from their collection. The walls are filled, on the floor stand larger pieces, there are creations hanging from the ceilings. In short it is wonderful and I try to visit every time I pass through Valldolid as there is always something new to see. 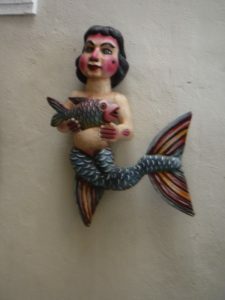 Wooden mermaid holding a fish. 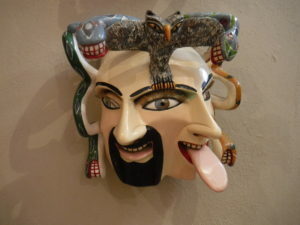 Carved wooden mask with two faces and a couple snakes. Three ceramic ladies going to market. Another mermaid with two trees of life sculptures nearby. 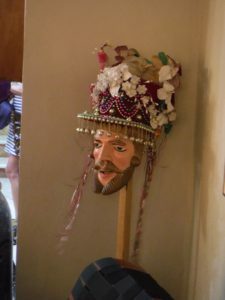 Carved wooden head with fantastic crowning hat. 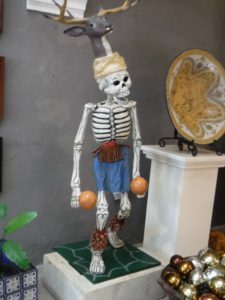 5 foot tall papier-mache skeleton with maracas and bells on his ankles. 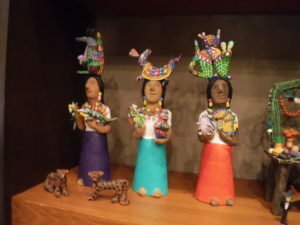 Art of sticks, gourds, paper, clay, and wood painted with bright colors to delight. 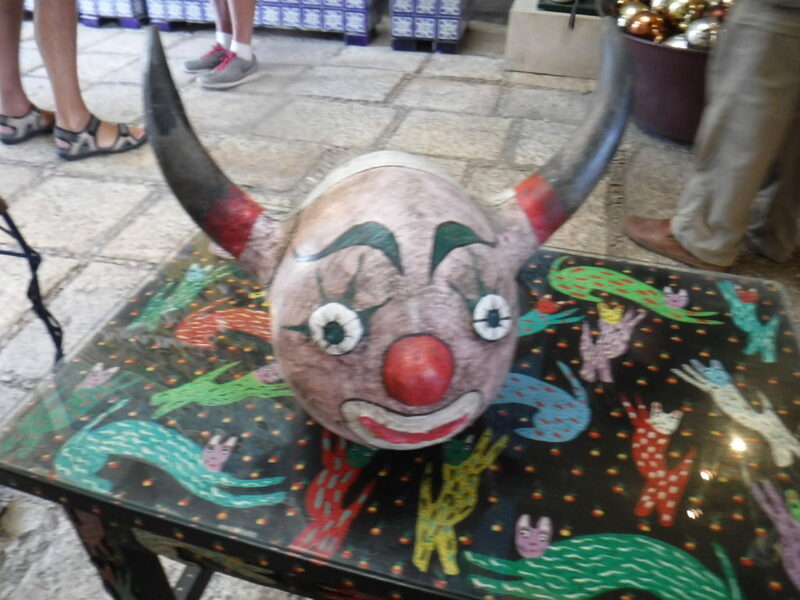 Clown head on a painted table in the lobby of Casa del los Venados.